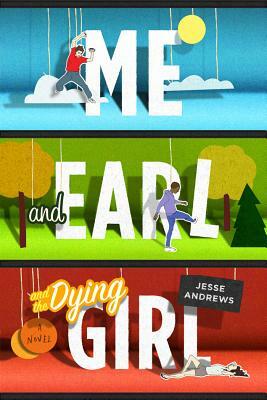 Me and Earl and the Dying Girl by Jesse Andrews. Grades 9 and up. Abrams, March 2012. 288 pages. Reviewed from ARC provided by NetGalley. This book had me literally laughing out loud. I'm always so pleased to find funny teen books because kids DIG humor and it can be so hard to find. Main character Greg has a very self-deprecating voice and uses humor at his own expense. There's a fair amount of gross-out humor, but those aren't the only laughs to be found. One of my favorite scenes was when Greg and Earl accidentally get high and then decide to make up a story to explain what happened. I was laughing so hard that I'm sure if my neighbors heard me, they thought I was insane. Jesse Andrews built a perfect arc for Rachel and Greg's relationship with her. Their friendship starts slowly as Greg gets to know her again, and at its peak I found myself caring about Rachel quite a bit and hoping that maybe she wasn't actually dying. But this is a story about a dying girl (it says so right in the title). Mr. Andrews manages to distance the reader from Rachel just enough so that it's not crushing when things take a turn for the worse. It all happens very organically. The humor's toned down as we enter a serious period in Greg's life and then picks up again at the end. Mr. Andrews throws in some different formats as we go, switching from straight prose to screenplay-like dialog that adds humor, keeps the pages turning quickly, and totally makes sense for Greg's character. Greg's a film buff and an amateur filmmaker and this bits show us how Greg sees the world. Greg wants to be neutral, just like the video cameras he uses - observing everybody impartially. But in order to make a good film, you have to decide where you stand and what you want to say. Ultimately, it's a story about knowing people's stories, about deciding whether to play it safe or take some risks and let people in. This is a spectacular debut and I sincerely hope there's more coming from Jesse Andrews. I would hand this immediately to teens looking for a funny story. Know your audience since there's a decent amount of profanity and crude humor. I'd try it on fans of Jordan Sonnenblick's Notes from the Midnight Driver or Brent Crawford's Carter Finally Gets It. I found out about this book through Capillya's fantastic interview with Jesse Andrews on That Cover Girl, so make sure you head on over there. As a sidenote, the book's cover is amazingly fantastic and I, too, kinda want to rub it all over my face. Also: I get an inordinate amount of delight from the rhyming title. Me and Earl and the Dying Girl will be on shelves March 1!